'La Truffière' is an adorable chalet lying in the heart of nature, with a 1 ha park at the end of a private road with no neighbours and surrounded by forest, at only 3 kms from a historical village classified 'Most beautiful villages of France' in the centre of the 'Perigord' surrounded by pre historical caves, famous castles, Sarlat, Les Eyzies... one can partake in especially good wine&cuisine. The inside of the chalet and the annex is all in wood and offers 3 rooms: 2 double bed rooms and one small room with 2 single beds. 2 rooms have air con. On the first floor of the Chalet is a living room (sofa for 6, TV (satellite), Hi-FI, DVD) with an eating area, a fully equipped kitchen, a shower room and a toilet. The stairs to reach the second floor is very steep thus not suitable for elderly or very young children. The annex offers an additional shower room and a restroom. The surroundings offers plenty of activities: river trout-fishing à 5 km, 2 golfs at 3 kms including a 18 holes golf course, canoe at 4 km on the Dordogne River where you can enjoy viewing the 5 main castles of Dordogne. A warm service: At any moment you need, local staff are available to help you. The garden and the swimming pool are taken care of every week at the time which is convenient to you. A guest book with useful information will help you to make your stay enjoyable. After setting up a consulting company in 1999, I became... an actor ! Working for companies as well as in Theatre and in Features. I have a lovelly wife and 3 boys ! La Truffière has been my Holiday house when I was teenager. My father used to rent it and finally we bought it ! There is a shower room in the chalet, an open air solar heated shower next to the pool and a semi-open air shower room attached to the annex. At 2 kilometers are 2 golf courses. La Truffière is fully furnished with: heater in all rooms for mid-season, 2 air-conditioned unit, hair-dryer, iron, etc. and complete garden equipment including tables, lounge-chairs, BBQ equipment, tennis-table, gym... 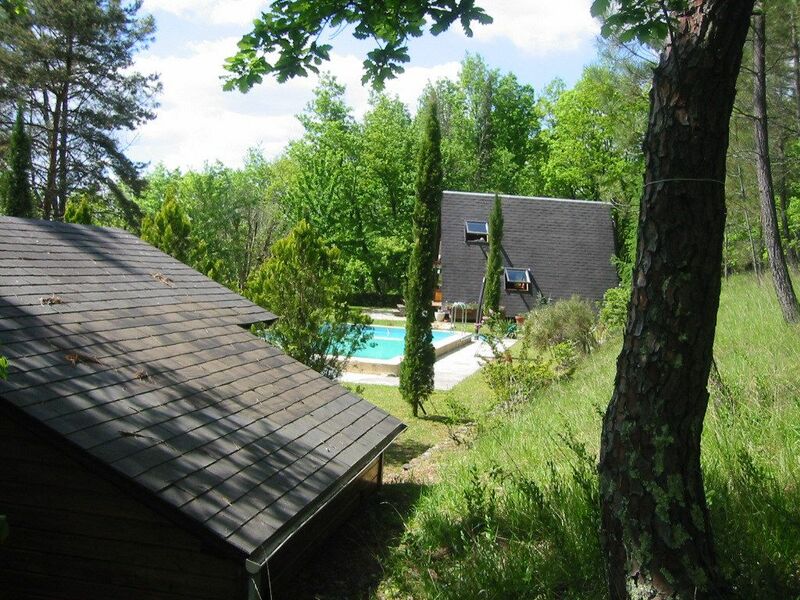 The private swimming pool (10x5m) has an outside shower, can be covered and heated, specially in mid-season. Shower room and toilet covered / half open air in a natural surrounding (not available in winter), and the garden offers an eating area and a covered but open-air additional living room. Please accept again my apologizes for the inconvenience. Quiet location, nice pool, a great place to relax. Lots of places to visit nearby, or just laze around. Steep ladder to bedrooms in main chalet, so those with bad knees will have to sleep in the cabin. Table and chairs in the garden, and sofas under an awning, barbeque. My family want to go back already. Just returned from a fantastic 2 week stay at La Truffiere. You could not ask for a more perfect location. Set behind electric gates in acres of woodland in complete privacy. Wildlife everywhere you look. Bear in mind that it is 1 hour drive from the nearest motorway. The main chalet has a reasonably spacious living area downstairs with a tv and dvd player. Kitchen has a 4 ring gas hob and a combi microwave which did the job but we could really have done with an oven as we usually like to eat in. Well equipped otherwise, plenty of knives, forks,plates etc. Having read previous reviews I can confirm that yes, you will have to use ant killer - but what do you expect in the middle of a forest? We just kept our food sealed or in the fridge. The bathroom is small and a bit dated. We mainly used the outside facilities joined onto the separate house at bottom of garden The stairs are unsuitable for toddlers or the elderly. We came with our 2 boys of 11 & 14 who loved it. Loads of room to run about. Evenings spent playing hide and seek in woods or sitting round outside seating area. The surrounding area is superb with loads to do within half hours drive. Caves, canoeing on Dordogne, Go Karting. Don't miss the Wednesday evening food market in Belves - but take your own plates, knives and forks and wine. Would definitely come back. Family of 4 stayed here and we truly enjoyed our stay here. All facilities as described provided us everything we needed. The house was very clean and well maintained, and the grounds and pool were excellent. The location is outstanding and very relaxing. Owner was responsive throughout the process and assisted us during our stay. Thank you Sylvain for an excellent break! Une propriété très grande et agréable à l'environnement particulièrement luxuriant, un aménagement extérieur sympa, bref, "the place to be" si on souhaite se reposer et se balader aux alentours. Belves est en outre un village médiéval qui vaut le détour. Nous sommes râvis de notre séjour et comptons revenir une prochaine fois. Seul petit regret, n'ayant pas eu très beau temps, l'eau de la piscine était tout de même très fraîche, si elle avait été chauffée, ça aurait été le top, car du coup nous n'en avons pas énormément profité. The property is located between Sarlat (historical town), Bergerac (Famous Wine / Aerport) and Montpazier, a former British Bastide. It is at only 1 km from a small river with trouts and 4 km from the main river la 'Dordogne'. Golf: There are 2 golfs near the property : Lolivarie Golf, 18 holes at 2 km and the Golf de la forge, 9 holes at 3 km. Bedlinen is included, 10KWH/day is included (covers normal use except air conditioning or pool heating), the extra will be passed at 0,2€/KWH. Obligatory end of stay cleaning €40. Breakage deposit : €250. Full rental fee payable 6 weeks prior arrival.